It’s hard to deny the appeal of using preserved moss – part of its charm includes creating an ethereal and natural woodland theme, as well as maintaining moisture levels in floral designs and hiding the mechanics of flower designs. Awhile ago, we explored seven ways to use moss and due to its continuing trend, we wanted to explore preserved Spanish moss more in depth. How to Preserve Spanish Moss? Thread-like in appearance and silvery-grey in colour, preserved Spanish moss has been cleaned and chemically treated to maintain its softness without being alive. Once the moss is coloured with a non-toxic dye, the moss is put through an oven at over 100 degrees Celsius. Completely safe (non-toxic) and easy to use, preserved Spanish moss lasts longer and prevents soil from discolouring. How to look after preserved Spanish moss? Our range of Spanish moss is sustainably procured and is best kept dry and used in an open environment such as terrariums and as a soil topper in potted flowers, as shown above. Keeping preserved Spanish moss in a closed environment or allowing it to become too wet can cause the moss to grow mould. It should be kept dry and out of direct sunlight to maintain colour, texture and shape. Additionally, some colours might run if the moss gets too wet. If preserved Spanish moss does get wet, the recommended use is 2 or 3 times before disposing. The same applies to preserved Reindeer moss. Is there a difference between dried moss and preserved moss? Absolutely. Dried moss is dormant and when rehydrated will return to life and start growing again. Bear in mind that some of the moss being sold as dried moss has in fact been preserved and cannot be bought back to life. Where as preserved moss is no longer alive and has been treated to maintain its look and feel. At Koch & Co, we only sell preserved Spanish and Reindeer moss. Spanish moss can be used in clusters or spread out – whichever way you choose, Spanish moss creates an elegant and relaxed woodland appeal and is especially popular as part of wedding decorations. 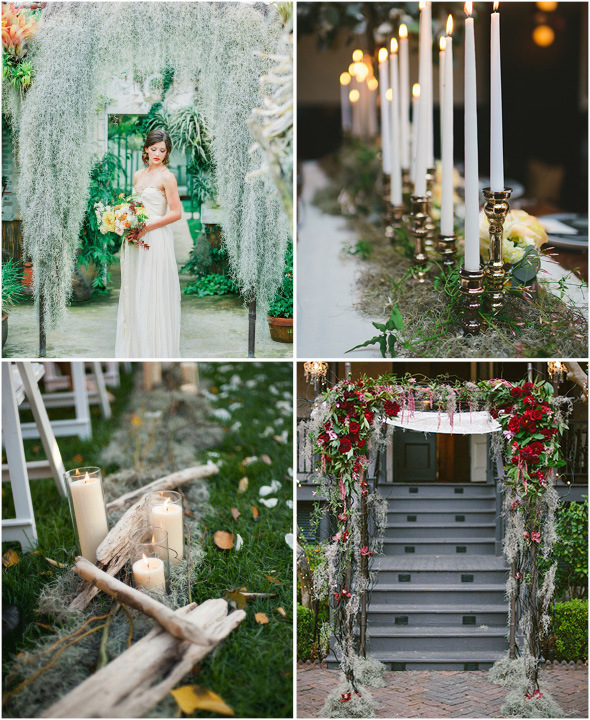 Work an abundance of Spanish moss into wedding arbours for a lush and draped look or spread the threads out and scatter along the table or aisle. Natural Spanish moss is actually not a moss at all, nor is it Spanish – it’s mostly found in Central and South America, as well as the warmer parts of Florida and South Carolina in the US. It does not have roots and thus does not require soil. Instead, this plant hangs from trees by the stems. In order for Spanish moss to grow, the correct mixture of heat (above 15C) and humidity (daily misting with warm water) is required. Historically, Spanish moss was used variously including insulation and mattress stuffing, whereas nowadays, it’s more commonly used as a topper for flower gardens and other floral inspired designs. What’s the difference between preserved Spanish moss and Reindeer Moss? Spanish moss is technically not a moss with a spaghetti-like appearance and grows in large, beard-like masses. When Spanish moss is preserved, it is often treated with chemicals and dyed in many colour variations, including black, purple and different shades of green. The colours we have are basil, coffee, grass green and natural. 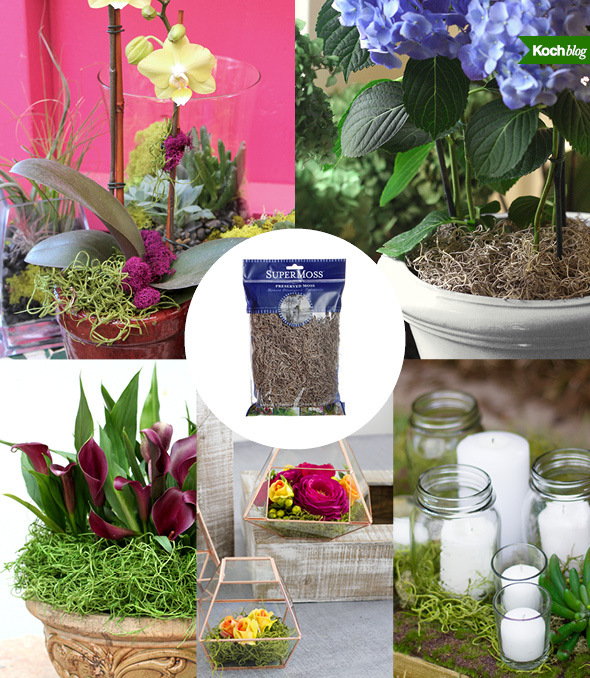 Spanish moss gives a soft feel to floral displays and is ideal for covering soil or dressing orchids. Reindeer moss, on the other hand is a greyish-green bushy and branched plant. Our Preserved Reindeer Moss has a fresh spongy feel and is also ideal as a soil topper. Reindeer moss eventually dries out after being exposed to air, however it will hold its shape plus the colour doesn’t fade. 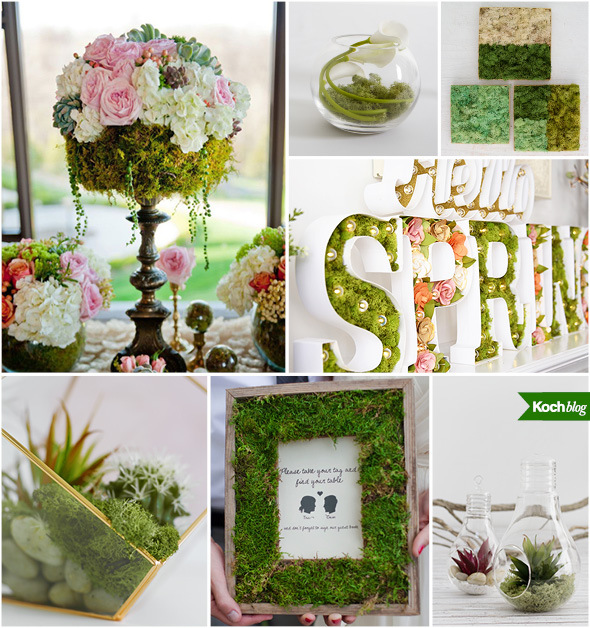 We mostly focused on talking about preserved Spanish moss, but preserved Reindeer moss is equally beautiful when used – imagine open glass terrariums, photo frames, cut-out letters and fresh or fake flower arrangements. We look forward to your reply and to helping you.